Taipei, March 13 (CNA) President Ma Ying-jeou (馬英九) said Sunday as he departed for Central America on a seven-day visit that there is "no caretaker period for diplomacy" and he will continue his efforts in that field until he leaves office in May. Ma is scheduled to visit Guatemala and Belize, two of Taiwan's diplomatic allies in Central America, on his 12th and final overseas trip as president. Ma began the first of his two presidential terms in May 2008. Asked why he was making the trip just two months before he steps down, Ma said one of his important tasks as president of the Republic of China (Taiwan) is to advance diplomacy. There is no caretaker, interim period for diplomacy, Ma said, talking to reporters on an in-flight public address system. In light of Taiwan's diplomatic challenges, it is vital for him to make one final push, the president said. During his eight years in office, he said, Taiwan has made significant diplomatic gains by adopting a viable approach. Ma said his administration adopted a policy of flexible diplomacy and abandoned strategies such as "scorched-earth and checkbook diplomacy". The president said he will continue to push forward with his flexible diplomacy policy until he leaves office on May 20. Taiwan's ties with its 22 allies have been warm and stable since he took office in 2008, Ma said, noting that Gambia was the only country that broke diplomatic relations with Taiwan during that period. That, however, was a personal decision by Gambia's president in November 2013, Ma added. In contrast, during the eight years of the previous administration, Taiwan gained three diplomatic allies but lost nine, Ma said. He was referring to the administration under Chen Shui-bian, the first politician from outside the Kuomintang party to become Taiwan's president. He also said that his administration has spent less than the previous government on diplomacy. His government's total allocation for diplomacy was NT$224.6 billion (US$6.88 billion) over the past eight years, compared with NT$240.9 billion spent by the previous administration, also over an eight-year period, Ma said. Another major diplomatic achievement of his government, Ma said, was obtaining visa privileges for Taiwan citizens. Taiwan passport holders can now obtain visa waivers, landing visas or e-visas to 161 countries and territories, the president said, noting that before he took office, only 54 countries and territories offered such preferential treatment to Taiwan. Ma is scheduled to meet with six foreign leaders on his current trip, which starts with a transit stop in the U.S. city of Houston, where he is expected to meet with several U.S. congressmen and visit Formosa Plastics plant, the largest Taiwanese investment in the United States. On March 14, Ma will arrive in Guatemala for talks with the country's new president, Jimmy Morales, and a meeting José Antonio Alvarado, president of the Central American Parliament (PARLACEN). Ma is also scheduled to address the PARLACEN, which is headquartered in Guatemala City. From there, he will travel to Belize on March 17 for meetings with that country's Prime Minister Dean Barrow and the leaders of three Caribbean allies - St. Kitts and Nevis Prime Minister Timothy Harris, St. Vincent and the Grenadines Prime Minister Ralph Gonsalves, and St. Lucia Prime Minister Kenny Anthony. Ma said he will invite the four prime ministers to attend the inauguration of Taiwan's next president on May 20. Having won the presidential election in January, Tsai Ing-wen (蔡英文) of the Democratic Progressive Party will become the second person from that party to become head of state. 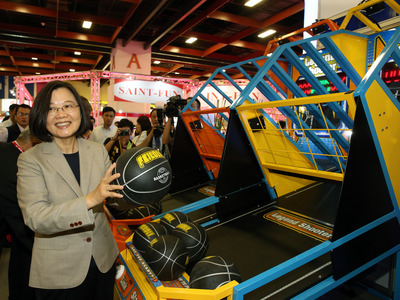 On his way back, Ma will stop over in the U.S. city of Los Angeles before returning to Taiwan on March 19.